2 drawing on paper (1 sheet) : ink ; 9.5 x 6 in. Ink sketch portrait of the artist's daughter, Carole, seated and another sketch of her proper left leg. 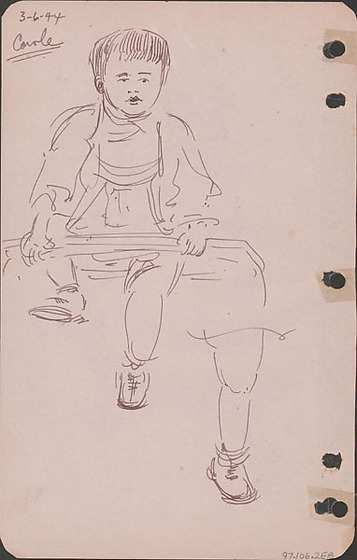 Top left sketch of Carole sitting with both hands holding onto a vertical bar across her lap as she lifts her proper right leg and her proper right leg dangles down. She has short hair with bangs and is wearing shoes. Bottom left sketch of Carole's proper left leg with shoe. Drawing 97.106.2EA on recto of same sheet. Written in black ink, top left corner: 3-6-44 / Carole [underlined].